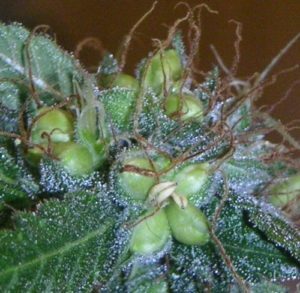 Want to learn how to make your own feminized marijuana seeds? So far in your growing process you have probably only worried about the ways to keep your plants happy and healthy – to both survive and thrive. Chances are, this has taken up most of your time. It has probably used up more of your time than you ever expected. How could you even think about doing something extra for your next time around? Plenty of growers who only want the marijuana for their personal use will simply allow the males to pollinate the females, and will remove the marijuana seeds from the harvest later. Meanwhile, keep your female plants in their vegetation phase for as long as possible. Once it is time for the flowering phase to begin, it’s time to use the pollen that has been stored in the freezer. Decide carefully which females you will want to pollinate. It could be because she exhibits specific qualities you like, or maybe she comes from the same strain as the male plant and it happened to be a great strain, so you want to keep the strain completely pure. Place the pollen in one cola of the female plant(s). Don’t pollinate flowers on that same plant, and don’t get the pollen in the flowers of the other plants, either. The process of pollinating your plants must be done carefully. For best results, separate the whole female plant to avoid contaminating the other plants around it. First, put the frozen pollen into a little bowl, and get a small watercolor paintbrush. Use this brush to glaze the pollen on the top of your female plant’s cola. After four days or so, put the pollinated female plant under 12 hours of sunlight and 12 hours of uninterrupted darkness. This is the point when you no longer have to worry about cross-pollination since the pollen will be firmly stuck to the cola. Keep a close eye on your pollinated female to make sure you harvest her seeds at a suitable time. Mature marijuana seeds will not be green, but rather will be some sort of brown color. Once the seeds are mature enough, simply use your fingers to take them out. Label the container with the seeds and then refrigerate them all. As long as they remain cool and dry, they won’t lose their ability to germinate next season. In the end, you will both have a nice, high-quality strain of seeds for your next growing period, and the rest of your unpollinated plants will produce wonderful weed. It is a great way to conserve financially while also increasing the quality of your future crops. This process involves the natural response of the females when they are under stress. When feeling stress or are reaching the end of their lives after not having been fertilized, females will actually start to grow pollen sacs without any male fertilization. This is a simple evolutionary response that allows plants that were never fertilized to continue their “bloodline.” Because the resulting seeds come from exclusively female genetics, the likelihood of them being female seeds is much higher than usual. Rodelization purposefully encourages this process to come about, exponentially increasing the odds of the seeds being female. Although it can be tricky, it is generally a simpler task than using the colloidal silver method. Because it’s a totally natural process, you will need to depend on your plant to act accordingly – and that can be risky. The main disadvantage of this method is its lack of reliability – even if everything goes right, the seeds might somehow not be feminized. Because of this risk (and the fact that leaving your plants in the flowering stage long past the ideal harvesting time will not help the harvest itself), you need to think long and hard about whether or not this is the method for you. Many growers choose this method because it is completely natural, and perhaps they are already organic growers. Some strains will work better than others for this method as well. Excellent........ Been creating some new strains but feminized seed's really seems to be the best way to go. Thanks again. Good stuff =P The only thing I'm wondering is, if you do either of these techniques would you be passing down hermaphrodite genes? Since it wasn't a hermie to start, these genes would not be passed down. It was a female forced to hermie. How much distilled water do I use? A pint, a quart, a gallon? First time experiencing a almost full grow. What are the downfalls and risks taking to make this plant feminized? Anything genetically "bad" different from the mother to the seedlings? That,s a great way to make female seed. I got one question, is it possible to do on branch only ?? Thanks Thomas. By Stop Birds Around Your Marijuana Plants Now! Skeeter , I do not use colloidal silver myself. However; If you join our Support Community; I am sure that one of our members or experts will have an answer for you. Will your female plants be stronger if you take the male plants away from them? Thanks Bloodrust for sharing. I'm so pleased I read all the way to yhe bottom now as your post was the needle in the haystack. Cheers! I need help sexing. I have pics but don't know how to post. Hi greengirl, you can post pics on the forum, our experts will be there to help you out. In this article it says to freeze the seeds, yet in the article selecting quality seeds it says that freezing the seeds can have a negative effect. So to freeze or not to freeze is the question. very interesting !!! THANKS FOR THE INFO.